Have you ever wondered if you were taking the right vitamin supplements for your body’s needs? There is so much information and opinions on whether you need supplements and if so which ones and how much to take. This can get really confusing, so let’s keep it simple for now and look at one mineral that is making the headlines more these days- Magnesium. Pumpkin seeds, sunflower seeds, okra, almonds, squash, sesame seeds, cashews, black beans, spinach and oatmeal based cereals – a lot of these are also high in fiber! As with any deficiency there are symptoms if you are lacking in magnesium. Fatigue is a common symptom because without proper magnesium intake the red blood cells become weaker, and their job is to transport oxygen to our cells to give us energy. Calcium and potassium deficiencies are also symptoms since magnesium aids in their transport in the body. This could lead to muscle cramps, dizziness, poor memory, anxiety and even heart problems. Of course you can take anything too far, so taking too much magnesium could slow your breathing and possibly cause an irregular heartbeat. As with anything- moderation! If you are wondering if you are deficient you may want to steer away from a blood test. 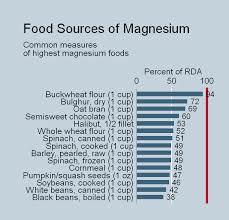 Magnesium is found in nerve, bone and organ tissue mostly. An effective test you can ask for at your doctor is the Exa test. It involves taking a scraping of the cells in the bottom of your mouth and has been found to be more effective than a blood serum test. Other factors that can actually deplete your body of existing magnesium are caffeine and excessive alcohol. As always watch out for those zero nutrient foods that are loaded with reined carbs and sugar. Refined sugars contain no molasses and therefore no magnesium and are just nutrient-less stomach fillers – not to mention loaded with calories. Now that you know a little more about magnesium and its crucial role in keeping our bodies healthy, go check you kitchen for those magnesium rich foods and perhaps watch some of these common deficiency symptoms disappear!